Take a trip back through the colorful history of Western Colorado and Crested Butte at the Crested Butte Mountain Heritage Museum. Featuring exhibits on skiing, mining, mountain biking, local personalities, town history and more, the museum provides visitors with a unique trip into the past. This museum celebrates the heritage of the Crested Butte community. Displays feature the areas industries of mining, skiing and ranching. The Crested Butte Mountain Heritage Museum delves into the past of this historic mountain town, exploring the people, natural history and more of this area. The Mountain Heritage Museum hosts a number of events throughout the year, including the Black and White Ball and a Summer Speaker series. Located in downtown Crested Butte at 331 Elk Avenue. $5/adult admission for the main museum, children free. For more information, call 970-349-1880 or visit www.crestedbuttemuseum.com. The Crested Butte Mountain Heritage Museum is a must-see stop for everyone who visits Crested Butte. In addition to interactive exhibits that feature model railroads, historic bikes, old photos and some of the unique characters that have been attracted to Crested Butte over the years, the Museum also shares valuable information on the geology and natural history of Crested Butte, and an exhibit on the Ute Indians provides insights into the people that inhabited the area before white settlers. A children's exhibit ensures that even the youngest visitors won't fail to be entertained. Previously home to the Mountain Bike Hall of Fame, this exhibit has moved to a new location in Marin, California. The Crested Butte Mountain Heritage Museum still features an exhibit on mountain biking and it's history in the area. Affectionately referred to as Tony's Conoco, the building housing the Crested Butte Mountain Heritage Museum has a lively history. Originally built in 1883, the building was home to a town blacksmith before becoming the first town gas pump. After housing the Crested Butte Hardware and Auto Supply store for almost 60 years, the building was saved and renovated by the Museum in 2001. The Mountain Heritage Museum hosts a number of events throughout the year. The Beachball Express: A fantastic winter fundraiser hosted by Crested Butte Mountain Resort and the Museum, complete with over 600 beachballs, costumed Skivenger teams and boku prizes! This is a great event for curious, history-loving skiers who will traverse all over the mountain finding answers to historical questions created by our Board of Directors. The Crested Butte Historic Pub Tour: Enjoy a tour of Crested Butte's most historically infamous bars. Every year a local celebrity will lead the tour of 4-6 historic bars in Crested Butte, while spinning stories of the town's past. This is a great opportunity to win cash and to learn more about the bar legacies of Crested Butte. The Black and White Ball is an outdoor street dance fundraiser for the museum. A small entrance fee gets you music, appetizers and admission to the funkiest formal in town. Just be sure to dress to impress in black and white. Every July 2nd from 6-10pm. Late July sees the annual Kick Ball Tournament, all ages welcome. The Summer Speaker Series brings local speakers in to share stories and photos with all. The Museum also hosts private parties. The Mountain Heritage Museum is located at 331 Elk Avenue in downtown Crested Butte. For more information, contact the Museum online at www.crestedbuttemuseum.com or by phone at 970-349-1880. The Mountain Heritage Museum is open daily from 11am-6pm. Admission to the main Museum is $5/adult, children under 12 are free. The front part of the museum is open free of charge. 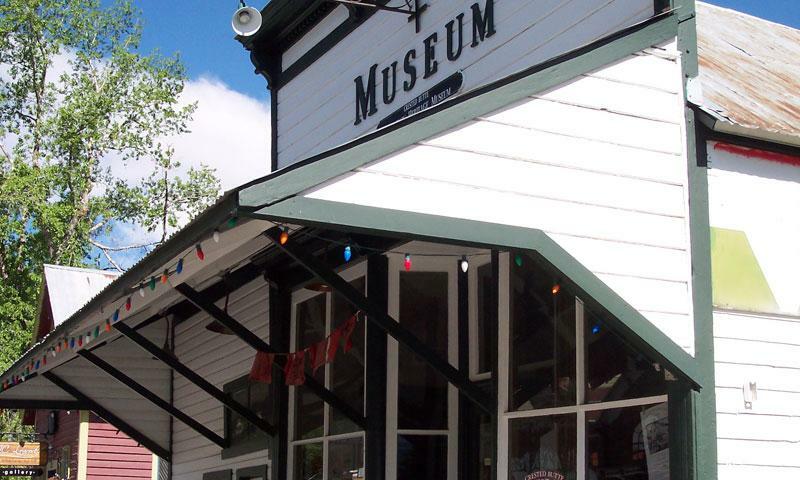 Visit the Crested Butte Mountain Heritage Museum.